So you’ve recorded all your instruments and room captures, you’ve got a basic mix going, and you’ve selected your delays and reverbs. Now what? As discussed in the prior articles, we are either looking for a sense of cohesiveness, or a surreal space that has some kind of orchestration to it. Our sonic elements for working toward our goal are the same as any other set of sounds: tone, texture, rhythm, and spatial cues. I’m not normally a mix-by-numbers sort of guy, and there is certainly no one way of working ambiance into your mix — however, I’m going to share some of my thoughts and techniques which you can lift or use to platform your own techniques. First, find your real spaces and focus on those. Room captures in particular can serve two very useful functions in a mix. First: they add actual living breathing space, which is something no other reverb can really do. Second, the room captures expose the sound of the space that the close captures possess at a much subtler level. In other words, the room captures put a magnifying glass on the sound of the space that is in the close-miking of any given instrument. This makes the room captures a great place to start. Also, if you tracked in multiple rooms, getting a sense of consistency here is of the utmost important. All the artificial reverbs can be tweaked to fit the sound of the real room(s), but the real rooms can’t really be tweaked to match the artificial reverbs, except to a small degree. Rhythm: If it’s late, use a gate. Expansive rooms yield long reverb tails and can throw off the rhythmic sense of a song. Fast songs and long tails are generally a rough combination. If it feels like the room decay is just hanging around too long, a gate can be just the thing to shorten it up. Just remember that hard-gating a reverb sounds unnatural, so a gradual gain reduction will be much more transparent. Conversely, if the room sound is too short, a compressor can bring up the tail and give the impression that the reverb is decaying slower. This is also a good trick to use if you want to create the sonic image of a large room when a large room is not at your disposal. Tone: In some genres, room sound is very desirable. Often in Jazz, Indie-Rock, and Classical styles you’ll want a specific and flattering room sound. For other genres like Pop, Rock, Hip-Hop, and Dance, a natural room sound can be undesirable. A room will have response up and down the frequency spectrum, but there will be specific areas of tonal signatures. These are the areas of sonic buildup that re-emphasize the content of what’s being played in the room. You’re going to find these in the midrange, and depending on the style, you either want to really emphasize these areas, or completely cut them out. Texture: Specifically, how the room reacts to transients and how diffuse the room is. Outside of some mild compression, there’s not much one can do about the texture of a room. Basically the best thing to do is to acknowledge the textural cues of the room sound, and note them for later when building the rest of the mix. Some mixes call for exceptionally dry sounds. Dry sounds can come off as stale or dead in the water. Even for things that are recorded in super dead isolation rooms, there is still a sound to the space. It’s just super subtle. Careful compression on the dry source can help the air around the source come up and create depth even where there is very little reverberation. Start with very long attack times and very short release times, and work your way to the point where the air develops, but the naturalness of the source is not overly compromised. Bright reverbs on dark sources. Dark reverbs on bright sources. Dense, coarse reverbs on smoother sounds like clean guitars. One of the beautiful psychological effects of reverb is that it can provide tonal content for a source that otherwise doesn’t have it. A good way to get high-end into a vocal that seems dark is to use a bright reverb. Once your reverbs are chosen, try soloing just the reverb returns. No dry sounds at all. Try to texturally, tonally and rhythmically match the reverbs and room sounds by adjusting the algorithm settings, EQ, volume and dynamic processing. Or, do the opposite: see if you can make the reverbs sound as different as possible for a surreal sense of space. It may also help to remove any resonances that are showing up in the room sounds. Natural rooms tend to have certain rings or resonances. In most mixes, it’s a good idea to get rid of these to open things up. But sometimes, those very resonances are what sound great. For example, guitar amps sound really cool in tight stone rooms because of the way the room resonates with itself. Delays were always a difficult element for me in my own mixing. I found that delays almost always cluttered the mix and distracted from whatever source fed them. I once brought this up on a forum and the consensus seemed to validate my feeling: you can really go to town on delays. One trick for this is to feed the delay through one of the reverb processors. 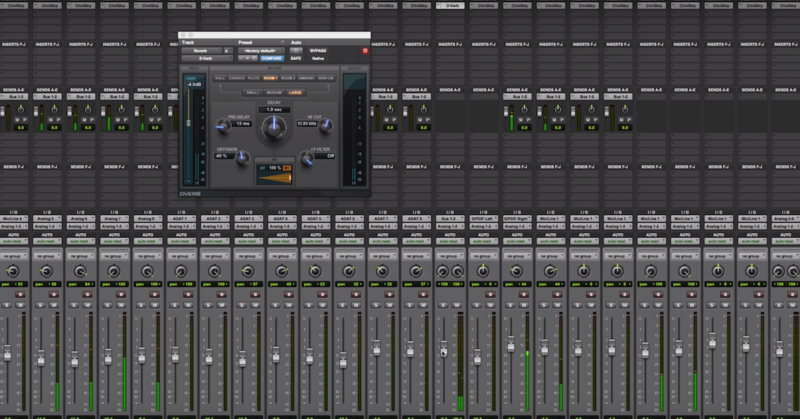 Then it’s the usual suspects: EQ and compression. This will help the delay feel like it exists in the context of the space. Hard filtering will also help delays work through the mix. One need not be squeamish about cutting large portions of the sound out. Likewise, many people recommended using distortion and other effects on delays to give them more texture and a more “musical” function in the mix. Mono delays can be great for adding depth, but changing the timing on the sides of the delay signal can add some nice width to the effect as well. Once you have made it this far, bring in a few of the dry sources — the ones that have a little room sound in the capture, like drum overheads. Listen to how the sense of space blends together now. A little surgical processing may help gel things together, but be careful not to compromise the dry sound. If you can’t get the space around the dry sounds to gel well with the room sounds, try feeding it through one of your artificial verbs. The most important idea here is to determine what is important for the song as well as aesthetics surrounding the genre. Indie-Rock loves some good reverb, so you want to be able to play up the room sounds without clogging up the mix and really blend artificial reverb tightly in with the natural room sounds. Rap vocals wants to be up-front and in your face. This means you need some elements with air and space around them, but only the subtlest amount, and probably a few elements that sound very far away to create effective contrast. It all ends where it starts: with what you want to achieve for the song. 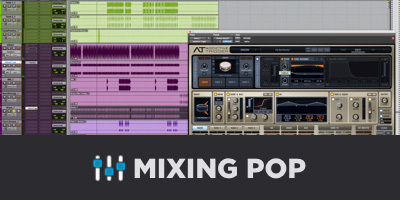 To learn more about how you can create an exciting, evocative, three-dimensional mix using reverb, check out our new Mixing with Reverb course, 6+ hours of in-depth training that will help you take your mixing skills to the next level.